As a man of size, I am leery when I hear about brands that promote a product specifically for people of size. I am sure that all brawn men, plus size men and big and tall men can relate. I am an XXXL man. I am 6’1, I weigh about 312 pounds and wear a size 15 shoe. I am leery of brands that are trying to take advantage of people of size. Some brands say that their products are catered to us, but they don’t cater to us at all. Some brands just want another quick buck and don’t care about the needs of people of size. So, when I heard of Big Fig. I was absolutely skeptical about the mattress brand. I am saying to myself “here we go, another brand that’s trying to exploit us.” I laughed to myself. I had plans to jump on the mattress and test it out. I knew for sure that the bed frame would break. I was prepared to slander the company because usually, I destroy mattresses. I have gone through mattresses the way most people go through sneakers. But, what grabbed my attention was that Big Fig offers a twenty-year guarantee. This I first discovered while doing some research and reading a few Big Fig reviews online. I have to say, their bed rocks! Any brand that offers a twenty-year guarantee, must believe in their product. From that point, Big Fig had my complete attention. Instead of offering a one-shot deal purchase, Big Fig believes in their product so much that they offer a twenty-year guarantee. I purchased a Big Fig mattress and I gave them the ultimate test. I invited my four-year-old nephew to my apartment to “play.” What my nephew didn’t know is that I was going to test out the mattress. So, we jumped on the mattress. 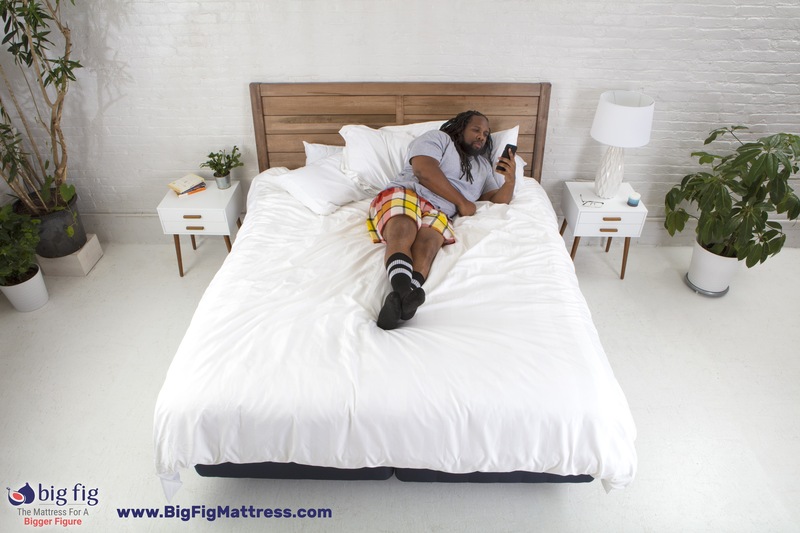 I wanted to see if Big Fig’s guarantee of the mattress not being indented was true. I sat on the corner of the bed while my nephew jumped tirelessly. Then I joined him! I jumped, at first with hesitation, because I thought the bed frame would break, but the mattress hardly moved! At all. The mattress absorbed the force. When I saw that mattress hardly gave, I was convinced! I have been regretting getting out of bed since. The mattress also has some cooling technology, which helps with sleeping comfortably. I am definitely in love with my mattress. Big Fig made a product that caters to people of size. At times, it’s hard to get out of the bed. The bed is so comfortable! I get phone calls and some of the friends already know what I am doing, I am laying down! Thanks, Big Fig! If you like what you read, leave a comment. Or you can email us at kavah.king@gentlemenscurb.com. Make sure that you subscribe to the blog to stay updated for content that is related to men of size. It’s the Gentlemen’s Curb a lifestyle blog where fashion meets fitness in a BIG way.